Membership in the organization is open to anyone interested in geosciences and related issues. Like the world itself, geology is a constantly changing science. We believe our organization should change as well — always moving forward — and one of the best. That is why we would be happy to have you join us at our meetings, on our field trips, and at the many other local events that we are involved in. Priority enrollment in all events, especially for field trips, where space may be limited. Participation in members-only field trips and certain meetings. Members-only quarterly social events – wine tastings, barbecues, potlucks, etc. 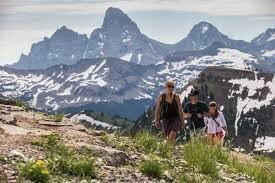 You can easily join the many friends of the Geologists of Jackson Hole here and receive our free monthly Newsletters. These invite you to our coming events and lectures. To join the organization as a member, please fill out an online application and pay your first year’s dues on this page.